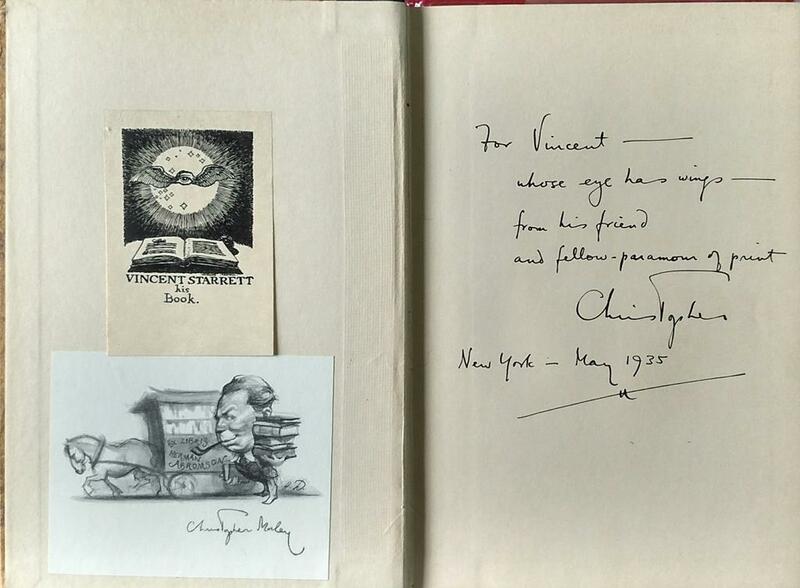 As my very fine 2015 book collecting campaign comes to a close this New Year’s Eve and the champagne awaits, I’m taking a few moments to reflect on my latest acquisition —three Christopher Morley titles inscribed to Vincent Starrett. Morley (1890-1957) and Starrett (1886-1974) were two of the most prominent biblio-writers of their time and still remain in the upper echelons of the pantheon. The men were also close friends, Sherlock Holmes aficionados, book hunting partners, and drinking buddies. 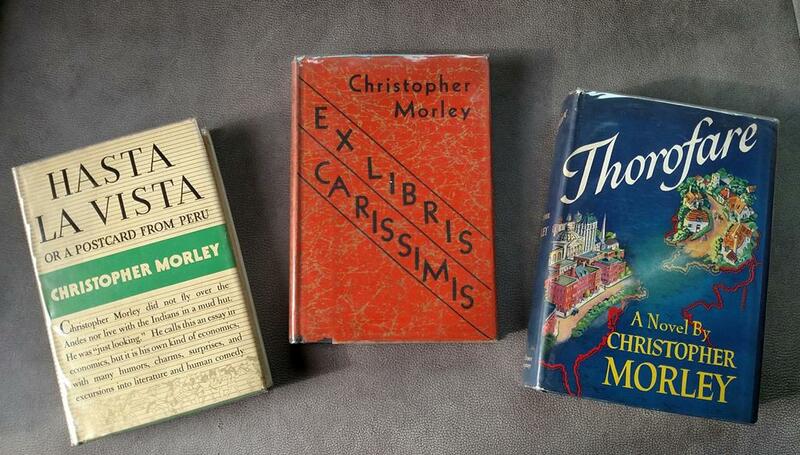 Ex Libris Carissimis (1932) is the most important title for my biblio-collection. These bookish essays were issued as a publication of the Rosenbach Fellowship in Bibliography. The second title, Hasta la Vista, or, Postcard from Peru (1935), is an entertaining travelogue, and the last is Thorofare (1942), an under-appreciated late novel. The three books reflect the diversity of Morley’s writings. All retain their original dust jackets and have Starrett’s ownership signature in addition to the inscriptions. As an added bonus, the books were later in the collection of pre-eminent Morley collector, Herman Abromson, with his bookplate in each. Vincent Starrett specifically cites below that both Ex Libris Carissimis and Hasta la Vista were two of his favorite Morley titles. Christopher Morley. Ex Libris Carissimis "from his friend and fellow-paramour of print"
Starrett provides a magnificent, lengthy homage to Morley in his autobiography Born in a Bookshop, pp. 268-272. 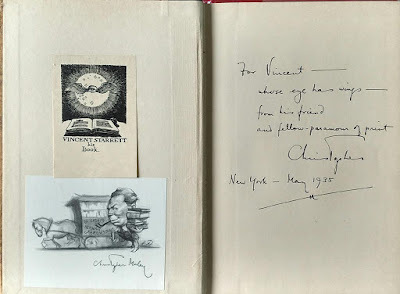 He writes, in part, “Among the American men of letters whom I have known, Christopher Morley stands first. I knew him longer and better than any other professional writing man of my acquaintance. . . And I was drawn to him more warmly than to most others by the peculiar correspondence of our interests. Whenever I am inspired to write a gay little piece of bibliofoolishness, or shout my appreciation of a forgotten story-classic, I always wonder if I am not repeating something already uttered by Morley. . .
“I don’t remember when I first met Christopher Morley. . . I have no clear recollection of one particular time or place: the experience, as a memory picture, is a montage of jovial alarums and discursions, of wistful flashbacks and exhilarating close-ups, of 221B culture and three-star Hennessy. We had been in correspondence for some years before we met. I had reviewed his enchanting fable, Where the Blue Begins, for Llewellyn Jones when it was first published, and he had written to thank me for a notice that he found ‘graceful, generous, and perspicacious,’ that is to say, a notice highly favorable to the book. Obviously this was a good beginning for a literary friendship, and that is really how it all began. “Ultimately, when he began to visit Chicago several times a year. . . we saw a great deal of each other and one us at least found the association stimulating. . . Sometimes we just rambled about Old Loopy, his name for Chicago, sampling books and Bourbon here and there and talking torrents of nonsense; and if occasionally we missed a barroom we never missed a bookshop. . . Suffice it to say that, whenever Christopher Morley came to Chicago, his friends had a lively time. . .
“Morley’s services to me over the years were numerous and helpful. He contributed entertainingly to several of my books and anthologies. He compiled an index for Books Alive (1940) that was so amusing it had to be moved from the back of the book to the front. . . My file of Morley letters is a bulky one; it is difficult to single out any one or two for special attention. They are literary letters in the best sense, crowded with references to his reading, his thinking, his drinking, his wrestlings with the muse, his opinions of the nuisances who interrupt writers at their work; the sort of chit-chat and gossip that bookmen love to read in the letters of Lamb and Fitzgerald. . . .